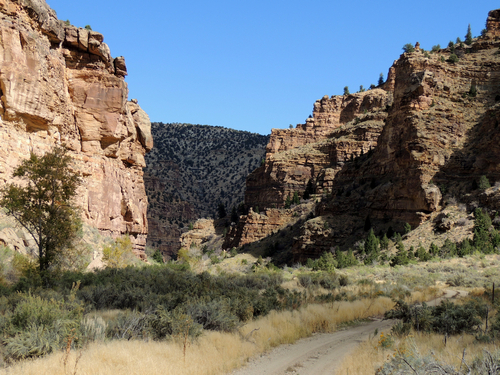 This is a great run that includes much more than just 9 Mile Canyon. Start on US 6 near East Carbon (eastern leg). This does the slow-going Jeep trail first and you can finish up on higher speed paved road at the end of the day. You will see the remains of 650 coke ovens near Carbon and an aerial tramway used to transport rock asphalt. 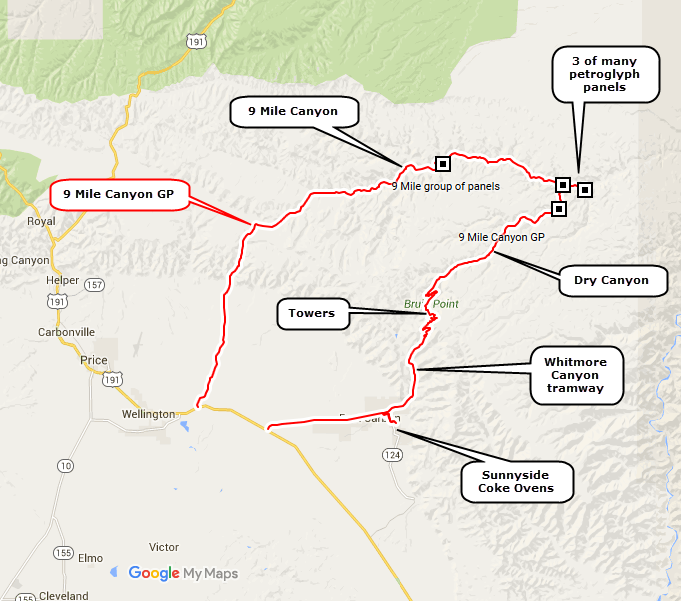 Climb to over 10,000’ elevation for panoramic views then drop down in beautiful Dry Canyon. 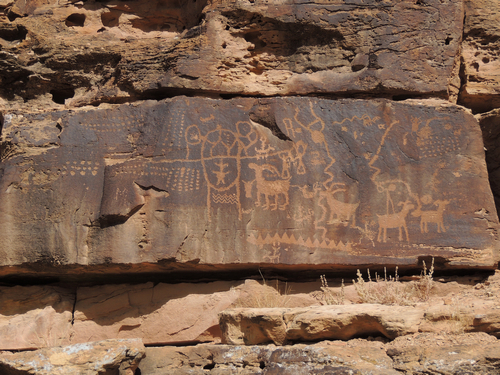 End the trip in 9 Mile Canyon with petroglyphs and other remains of the ancient Fremont Culture. The Sunnyside coal mine was located at the mouth of Whitmore Canyon, about 26 miles east of Price, Utah. 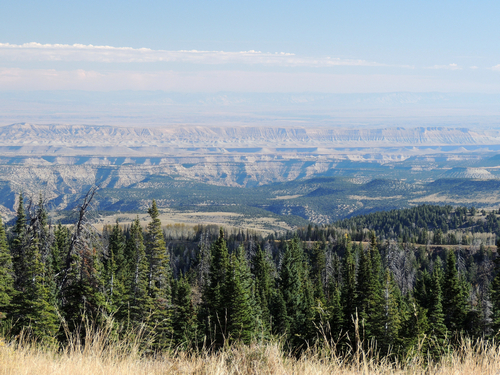 The first coal mine was opened in Whitmore Canyon in eastern Utah in 1896. At about the same time, that mine became known as the Sunnyside mine. The coal was of good coking quality, and Sunnyside became the major supplier of coke in the intermountain region. In 1899 the mine was purchased by Utah Fuel Company, as a subsidiary of Rio Grande Western Railway. For the years following, the Sunnyside mine was a major source of coking coal, and coked coal (also known as metallurgical coal, or met coal) for the entire Western United States. By 1909 the Sunnyside mine was mining 3000 tons of coal per day, with most of it feeding the 650 coke ovens that were located adjacent to the mine. During 1914 alone, the coke ovens at Sunnyside furnished over 300,000 tons of coke (7500 car loads, or about 20 cars per day), with most if not all of it being shipped to the copper smelters at Anaconda, Montana. During the 1920s and 1930s, smelters were updating their processes to allow the direct use of coal, and several iron and steel plants were built that could also use coal directly instead of using coke. By 1942, the coal from Sunnyside was being shipped to either the new U. S. Steel plant at Geneva, Utah, or to the new Kaiser Steel plant in southern California, all to support the war effort. In 1943, Kaiser Steel directly leased the entire Sunnyside mine from Utah Fuel Company, and in 1950 Kaiser Steel purchased all of Utah Fuel Company, which owned coal mines at Sunnyside, Castle Gate, and Clear Creek, all in Utah. 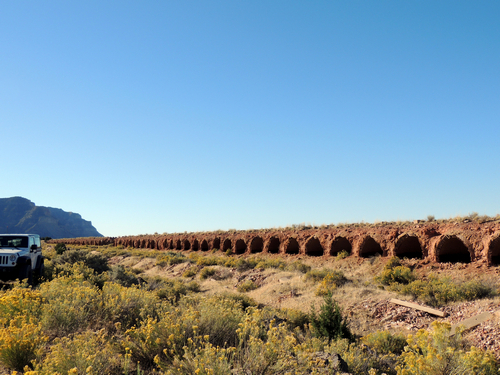 The beehive coke ovens remained in operation until 1958. 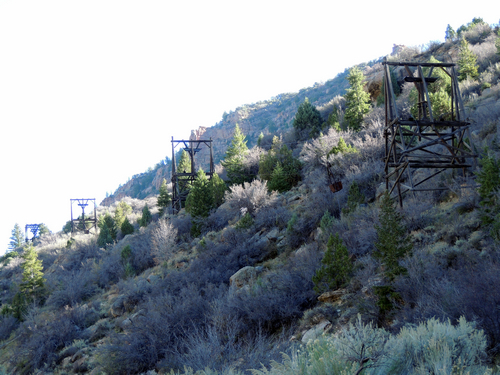 ​Rock asphalt was first mined at the top of Whitmore Canyon - 15 miles from US 6 - in the early 1890's. The mine closed in 1898 & reopened in 1903. It operated erratically until 1915 when it was forced to close due to the development of sheet asphalt. In 1927 another company tried to develop a rock asphalt industry. 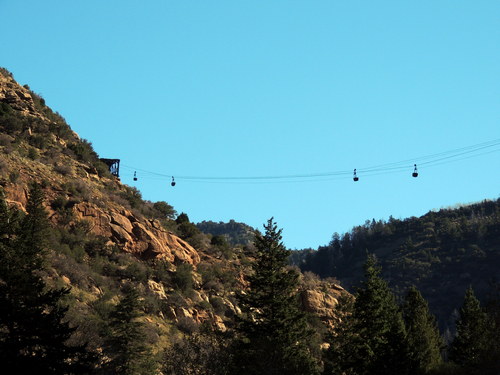 They spent over 1/2 million dollars on equipment including a 3 1/2 mile gravity powered aerial tramway. You will pass remnants of the tramway on your way up Whitmore Canyon. To promote the use of rock asphalt for paving, it was sold for $8.00/ton even though production costs exceeded $16.00/ton. The Rock Asphalt Co. of Utah took over in 1932. The mine operated only about 2 months out of the year & eventually closed. Interest was rekindled in the 1970's but nothing ever developed. Climb up through Whitmore Canyon to towers at over 10.000'. Great views in all directions. 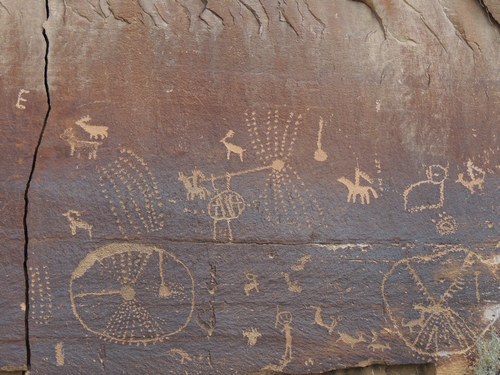 ​Down the other side into Dry Canyon where there is a small, but interesting, petroglyph panel. Dry Canyon ends at 9 Mile Canyon, site of hundreds of petroglyphs and other remains of the Fremont Culture. 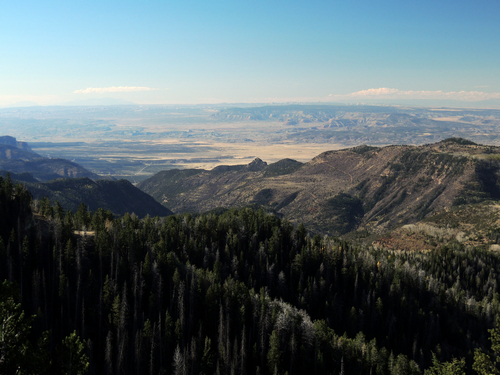 BLM and Nine Mile Canyon Coalition are 2 of many websites where you can find information. 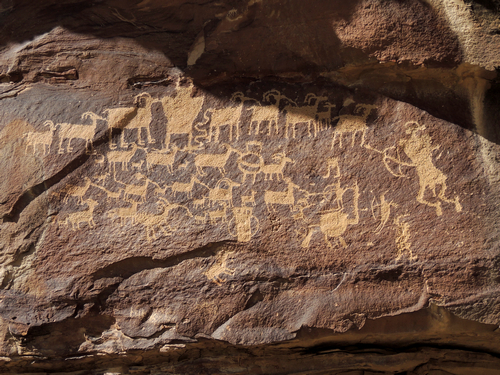 The Great Hunt panel (photo at top of page) is the most famous panel in the canyon. 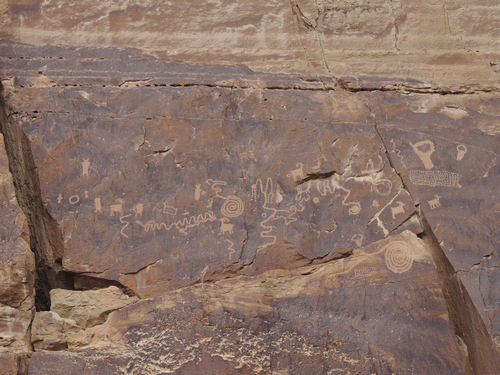 The following panels are at the mouth of Daddy Canyon - near the intersection of Dry Canyon and 9 Mile Canyon.